Not-So-Mellow Yellow | Small, but valuable. I’m just going to go with vanity and fluff two days in a row. Why not? Yesterday hair straightening, today yellow shoes. Tomorrow I’ll take over the world. Why yellow shoes? Because my BFF is getting married, and us bridesmaidy types are wearing yellow shoes, that’s why. I think it’s a brilliant idea. 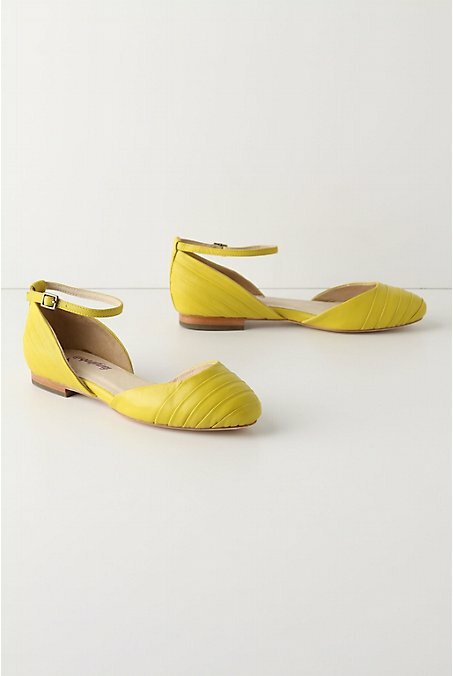 There aren’t many perkier colors in the world than yellow, and there’s nothing like perky feet to usher you up the aisle to your man (or her to her man, anyway). Also, I’m entirely biased because I was a card-carrying member of the yellow team at a summer camp for two years. Cheering about yellow every day for five or so months of your life really skews your thoughts about colors. Propaganda is powerful stuff. I don’t intend to wear cleats to her wedding, but she would probably laugh and move on with the day. She’s a good egg. In non-yellow-shoe news, I discovered why I haven’t been able to get to bed before 1 A.M. this week. I mentioned to a co-worker (who happened to be a nurse for most of her career) that I’ve been on prednisone for jaw stuff this week, and the doctor didn’t really tell me what in the world prednisone is supposed to do for me. I’m not a fan of taking medicine just for the heck of it. Should have asked him in the appointment, right? Anyway, my wise nurse co-worker informed me of prednisone’s potential side-effects, such as hyperactivity and the inability to get to sleep easily. The truth is that I have a bad habit of staying up too late and medicine is just a good excuse for the week. It’s nice to throw in a new excuse every once in a while. I’m not an irresponsible night owl this week, I’m on medicine. top shoes are adorable. middle shoes would make me want to curl up in a ball at the beginning of the aisle and ask to be pulled up to the altar by any willing body. I also can barely handle a 1/2″ heel, though, so perhaps our abilities and corresponding perspectives differ slightly. bottom shoes could come in handy for a surprise game of soccer at the reception. usually happens. yeah, i’m fine with heels up to 3 1/2″, but there’s something significantly different about anything higher than that… possibly something to do with weight distribution. anyway, your vote for comfort (and spontaneous soccer) has been noted and appreciated. and if i ever see you begging for someone to pull you to the altar, i’ll be happy to help. My vote is for the cleats. Maggie, great idea for a soccer game! I’m in… let’s all wear cleats! A cleat wedding! Seriously, go for whatever blows your skirt up. You’re going to look beautiful in either, and I personally like the comfort option. That way you won’t want to slit your own throat during the ceremony. I don’t want to be responsible for that. Another thought… there are going to be some pretty cute groomsmen, and the added confidence that comes with killer legs is not something to be ignored. But you have pretty hot legs in the first place, so I changed my mind. Flats. Or middle ground…. I’ll keep my eyes peeled. Could we have a 4th option? Take your camera to Nordstroms. Nope, flats, heels, or cleats. It’s an unfair world.